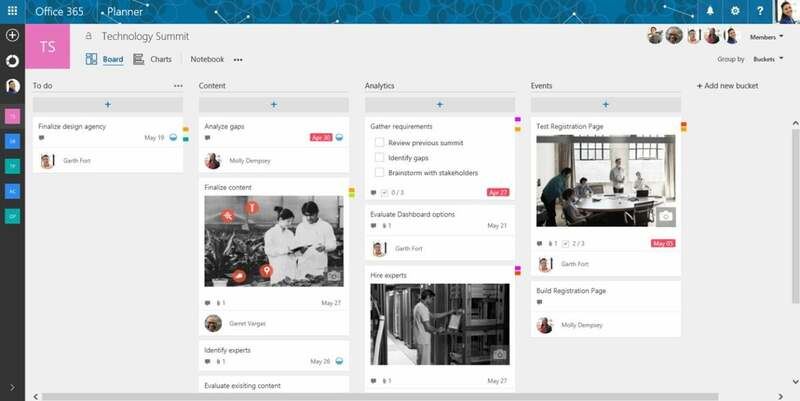 The main way to interact with Planner is through the Board view, which contains task cards, each organized into lists or “buckets.” Individual cards contain information such as task description and due date. Files can be attached and team members can leave comments within the card. Team leaders can then assign a task to individuals or multiple team members, who will be notified by email. There is also a Charts view that provides a higher level overview of work that’s under way, enabling team members to see the status and progress of various projects at a glance. This makes it easier to see if a project falls behind schedule or when a team member has a looming deadline. 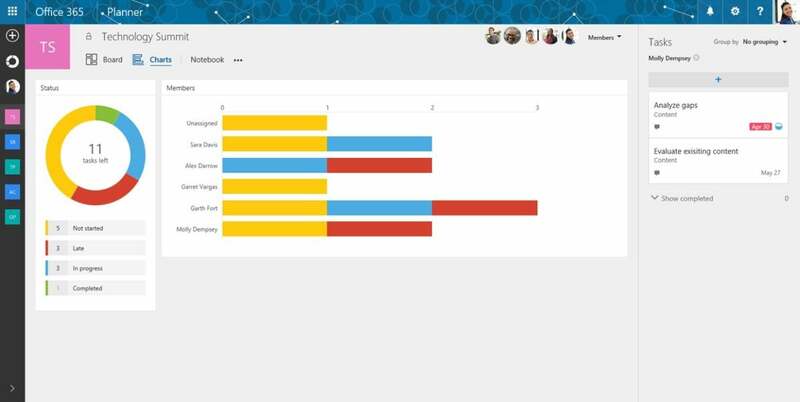 The Charts view also shows which tasks a team member has been assigned, offering an overview of their current workload and work completed. Since launch, Microsoft has steadily added to Planner. This includes a refreshed UI, and new functionality such as a connector into Microsoft’s IFTTT-style app integration tool, Flow. Support for iOS and Android devices was announced in May, enabling users to view and update plans on the go once they have been created using the web app and push notifications are now enabled for the app. Planner’s most obvious strength lies in its integration with other Office 365 tools, such as Teams and Project. For example, it is possible to link a Project Online task to Planner. This allows a project manager to offload the management of a task to a colleague using Planner. Shared files are stored in SharePoint for easy access and each board is connected to a OneNote Notebook for team members to view. It is also integrated with Office365 Groups, making conversations available in Outlook.